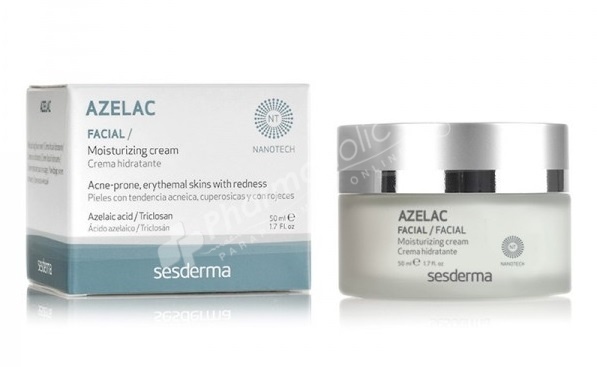 Sesderma Azelac Hydrating Cream combines the properties of azelaic acid and moisturizing action of glycine. It has a calming and anti-radical, fighting redness and impurities that accompany the blotches. Sesderma Azelac Hydrating Cream combines the properties of azelaic acid and moisturizing action of glycine. It has a calming and anti-radical, fighting redness and impurities that accompany the blotches. Sebum regulating action, decreasing the secretion of sebum and eliminating pimples. Inhibits the synthesis of tyrosine, homogenizing the skin color. It also has anti-aging and anti-wrinkle properties. Increases skin hydration and elasticity. Vitamin E is an antioxidant and anti-aging. Reduce radical stress and oxidative damage caused by ROS (Oxygen Free Radicals). With your fingertips, apply a small amount of cream to the face and neck and massage until fully absorbed. Apply morning and evening or as often as required. Allows immediate makeup.